Investigate Zoo life with our many teen programs. We offer seasonal as well as year-long programs including our popular Conservation Discovery Corps and our Explorer Post. 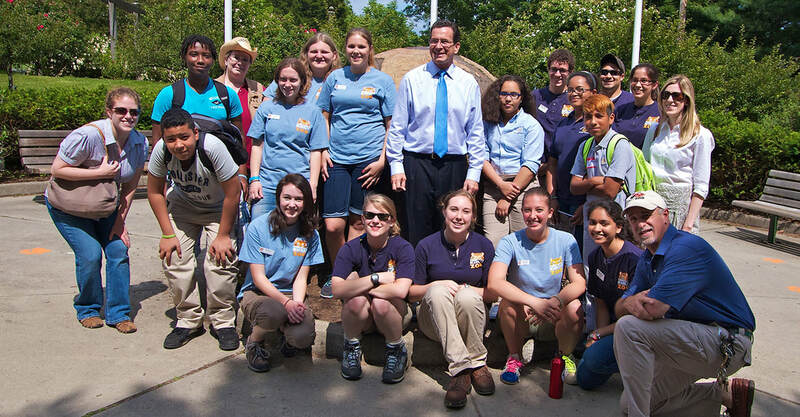 Our programs will inspire and motivate teens looking for hands-on Zoo life experience. Investigate Zoo careers from animal care to development and marketing, to visitor services and maintenance to Zoo director. Teens, 14 – 18 interested in learning more about Zoos and Zoo careers are welcome to join our Explorer Post. Zoo Explorer Post members attend career workshops with hands-on activities, take part in job shadows, develop a public presentation and create a year-end project. Program fee of $120 covers all project materials. Please click here to read more about the program before applying. Registration for 2019 is closed. Get involved with local conservation education and field work. Qualified high school students will have the opportunity to work side by side with field biologists, study the role of zoos in conservation and help educate the zoo’s visitors. This is a year-long program with the opportunity for greatest involvement during the summer months. Applications accepted through January 15th each calendar year – Training starts in February. Please click here to read more about the program. Boehringer Ingelheim Cares Foundation, Inc.
For youth between 7 and 18 who are interested in learning more about the animals at Connecticut’s Beardsley Zoo. Meetings are held in the mornings at the Zoo on the 2nd and 4th Sundays of the month from September to the end of June. Members work alongside Animal Care staff cleaning and maintaining the Farmyard animals. All new members must be signed up by the end of May. Call (203) 394-6565 ext. 144 Sunday – Thursday for more information.